The Americans matched up against the Thunderbirds in Kent this evening. After finding themselves down 3-1 early in the second period the Ams were able to come back and earn a 4-3 victory. Tri-City is now 4-2-0-0 against Seattle this season. Snoqualmie Pass was closed Tuesday due to inclement weather forcing the Americans team to take an alternative route to Kent. The long travel didn’t seem to affect leading scorer Parker AuCoin who tallied the game’s first goal short handed off a stretch pass from Samuel Stewart. AuCoin now has four short handed-goals this season and eleven throughout his WHL career. Andrej Kukuca tied the game for Seattle with just seconds left in the first period. Early second period goals from Matthew Wedman and former Tri-City American Keltie Jeri-Leon gave the Thunderbirds a 3-1 lead. 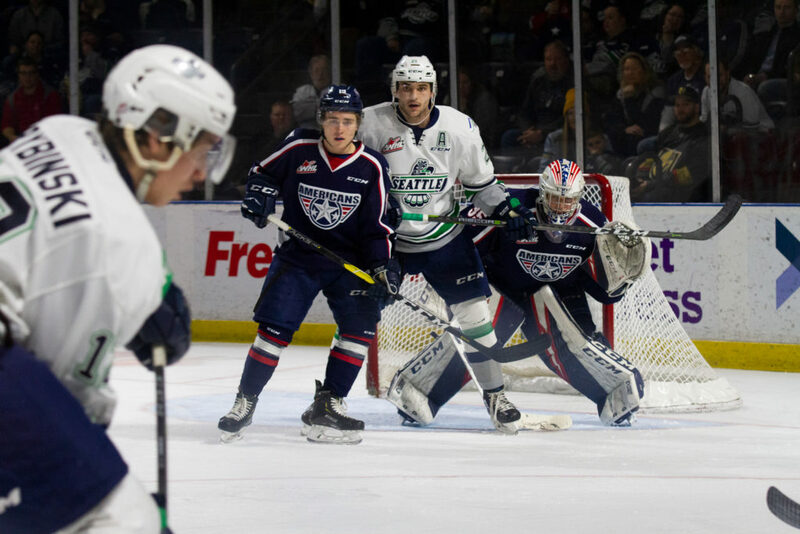 Krystof Hrabik, Aaron Hyman, and Sasha Mutala each scored within a four minute span in the second period taking a final 4-3 lead for Tri-City. The Americans next play on Friday against the Kamloops Blazers. Five inches of snow fell outside the Toyota Center yesterday so we’re giving fans $5 off adult tickets to Friday’s game! This flash offer is only available online. Buy here.